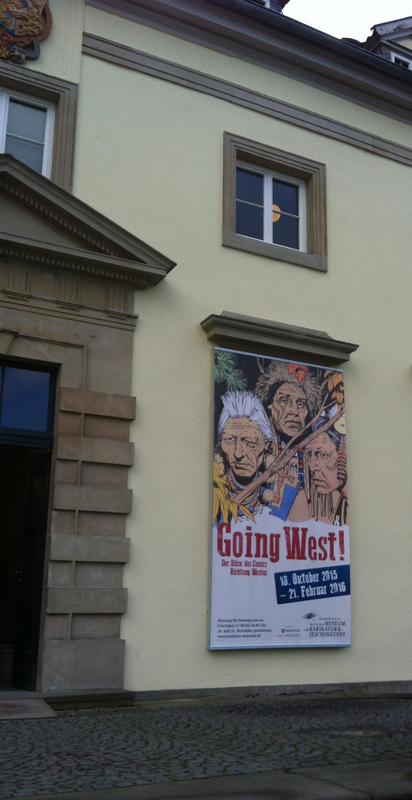 Last month, “the most comprehensive exhibition about the genre to be held in Germany” opened at the venerable Bundeskunsthalle in Bonn, where it can be visited until September 10. 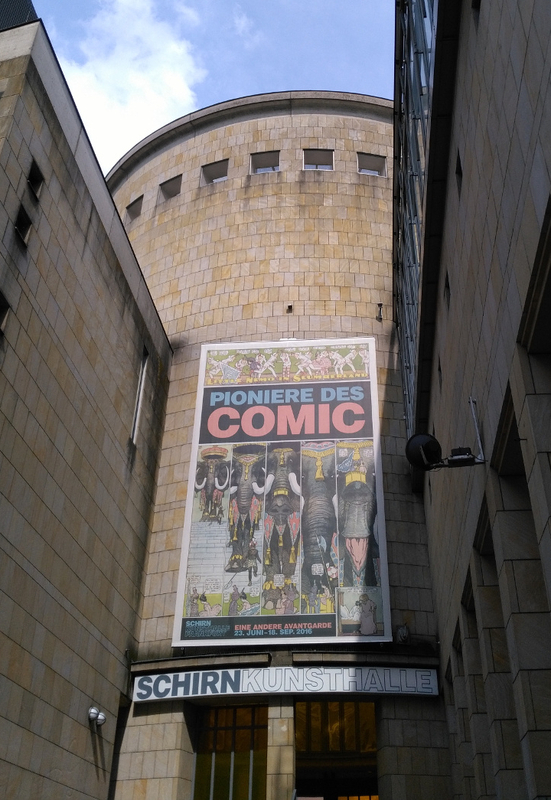 Curated by Alexander Braun and Andreas Knigge, it is a remarkable exhibition, not only because of its size (300 exhibits) but also because it tries to encompass the whole history of comics without any geographic, chronological or other limits. To this end, it is organised in six sections. The first section is about early American newspaper strips. The amount of original newspaper pages and original drawings on display here would be impressive if there hadn’t been another major exhibition on the same topic not even a year ago. Still, it’s always interesting to see e.g. a Terry and the Pirates ink drawing alongside the corresponding printed coloured Sunday page (July 24, 1942). Another highlight in this section is an old Prince Valiant printing plate, or more precisely, a letterpress zinc cliché which would be transferred on a flexible printing plate for the cylinder of a rotary press, as the label in the display case explains. Section 2 stays in the US but moves on to comic books. In its first of two rooms we find mainly superhero comics, again often represented through original drawings e.g. from Watchmen or Elektra: Assassin. The second room of this section is about non-superhero comic books; outstanding exhibits here are the complete ink drawings to two short stories: a 7-page The Spirit story by Will Eisner from July 15, 1951, and a 6-page war story from Two-Fisted Tales by Harvey Kurtzman from 1952. 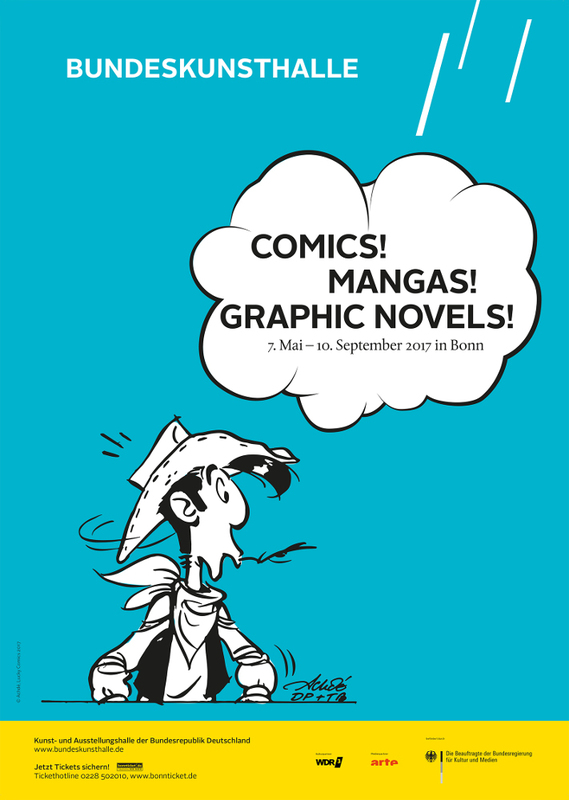 The next section of the exhibition is dedicated to Francobelgian comics. There’s an interesting display case with a side-by-side comparison of the same page of Tintin in various original and translated editions, and there are also original drawings by Hergé, but perhaps even more impressive is an original inked page from Spirou et Fantasio by Tome and Janry, who revitalised the series in the 80s. In the same section, half a room contains examples of old German comics, both from East and West Germany. And then we get to section 4, the manga section. The biggest treat here are several Osamu Tezuka original drawings from Janguru Taitei, Tetsuwan Atomu and Buddha. There’s original Sailor Moon art by Naoko Takeuchi as well. Most of the other exhibits, however, are from manga that are far less famous, at least outside of Japan. In this section there’s also the only factual error I found in the exhibition: a label on Keiji Nakazawa’s Hadashi no Gen says, “Barefoot Gen is one of the earliest autobiographical comics ever.” While Hadashi no Gen was certainly inspired by Nakazawa’s own experiences, it is a fictional story, not an autobiography – that would be Nakazawa’s earlier, shorter manga, Ore wa Mita. Section 5 is about underground and alternative comics from both the US and Europe. The highlight here is the famous Cheap Thrills record by Big Brother and the Holding Company, which can be listened to via headphones. Most comics enthusiasts are familiar with the record cover by Robert Crumb, but perhaps not with the music on the album. The sixth and last section is titled “Graphic Novels”. It is already unfortunate enough to make the dreaded ‘g-word’ part of the exhibition title, but this section makes things worse by not actually problematising the term or even analysing the discourse around it. Instead, “graphic novel” is meant here to comprise a vast range of contemporary comic production, including Jirō Taniguchi’s manga, pamphlet comic books such as Eightball and Love & Rockets, and Raw magazine. 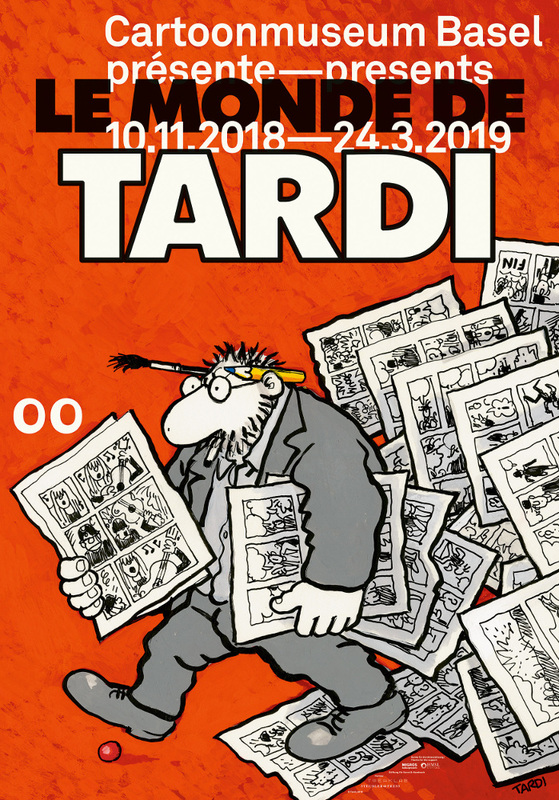 The exhibition as a whole offers a lot of interesting things to see, but maybe its aim to represent the whole comics medium was too ambitious in the first place. Nowadays, no one would dare to make an exhibition about the whole history of film, or photography, but apparently comics are still considered peripheral enough that the whole medium can be squeezed into one wing of a museum. The general public, at whom this exhibition is presumably targeted, will probably discover many new things about comics, but for people who are already comic experts, the knowledge to be gained from this exhibition will be much smaller. Pioneers of the Comic Strip – A Different Avant-Garde (Schirn Kunsthalle Frankfurt, until September 18, 2016) is an exhibition of six American newspaper comic artists whose strips started between 1904 and 1921. So instead of creators such as Rudolph Dirks or Richard F. Outcault who actually pioneered the comic strip form, curator Alexander Braun (who had also curated the Going West! exhibition) has selected artists who in some way could be considered avant-garde. The problem with the concept of the avant-garde in comics is that comics developed largely independently of modernist printmaking, draughtsmanship and other ‘high arts’. Nevertheless, this exhibition – hosted by a major fine art museum, after all – tries to find links between comics and avant-garde movements such as Expressionism and Surrealism, with varying success. The first exhibit isn’t a comic but a film: Winsor McCay the Famous Cartoonist of the N. Y. Herald and His Moving Comics from 1911. Apart from that (and McCay’s Gertie the Dinosaur film), there are almost exclusively original newspaper pages and some original drawings on display. In other words, there are a lot of comics to read, which can be tiresome, but it’s better than the reproductions or book covers that one gets to see at other comic exhibitions. In some cases, they even managed to obtain the original drawings to corresponding newspaper pages and show them alongside each other. Apparently McCay was included in the exhibition because he “can be considered the first Surrealist of the 20th century” (my translation). Salvador Dalí and René Magritte are also name-dropped in the text that accompanies McCays section of the exhibition. This is the central theme of the exhibition: all of the comic artists are judged by their relation to fine art and its avant-garde movements. The same is true for Lyonel Feininger, whose comic work is evaluated here as the job that had given him the financial freedom to pursue painting, and for Cliff Sterrett, whose stylistic changes in Polly and Her Pals are traced back to developments in high art (“echoes of the Bauhaus era” etc.). The other three featured artists are George Herriman, Frank King, and, as the only really surprising choice, Charles Forbell. Forbell doesn’t even have a Wikipedia article, and apparently he only did a handful of episodes of his comic strip, Naughty Pete, in 1913. Each page is elaborately composed and lavishly coloured, but unfortunately he never used word balloons around his dialogue text. In some episodes he used different lettering styles for different characters, but in others it’s bothersome to figure out who says what. In a way, Naughty Pete is symptomatic of large parts of the exhibition: from a ‘high art’ perspective, one can see the avant-garde sensibility to it and why it was included in the exhibition, but from a comics perspective, it has neither been particularly influential nor is it actually that great a comic. 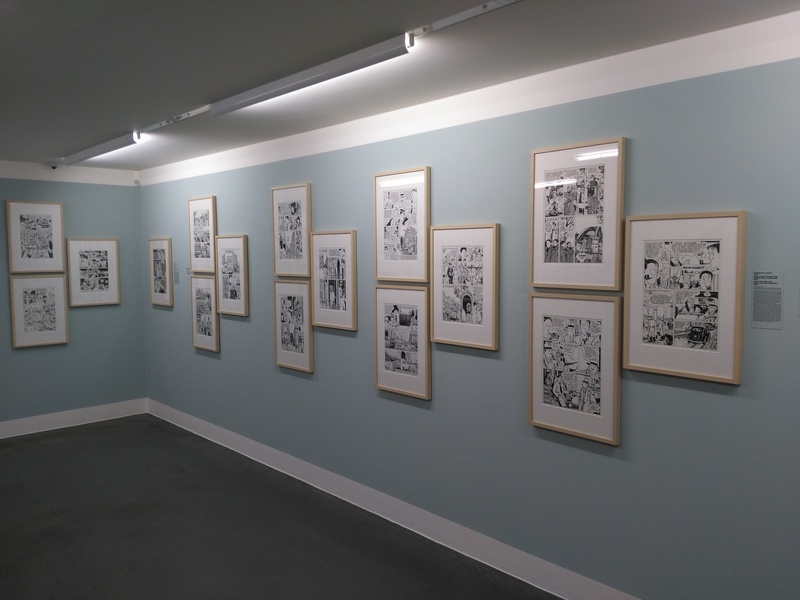 Speaking of Joe Sacco, there is a Sacco exhibition currently shown at Cartoonmuseum Basel until April 24. There is a lot to see there: the exhibition starts with original drawings from Sacco’s early comics, of which I found the juxtaposition of a “Zachary Mindbiscuit” story from 1987 and “More Women, More Children, More Quickly” from 1990 (both unpublished until the 2003 collection Notes From A Defeatist) the most interesting. While already an accomplished draughtsman in 1987, it wasn’t until “More Women…” that Sacco started positioning his caption boxes in oblique angles, which would become one of his trademarks. 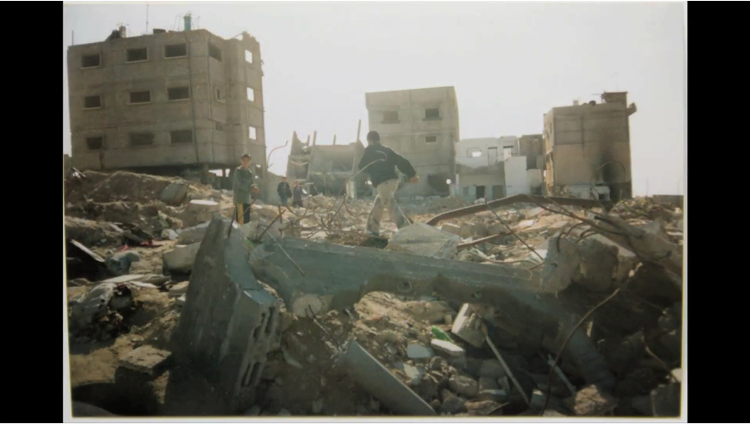 Sacco’s main works, Palestine, Safe Area Goražde and Footnotes in Gaza, are all represented through original drawings (10 episodes from Palestine alone) as well. Another fascinating exhibit in this context is an arrangement of Sacco’s notebooks and reference photographs, next to the corresponding pages from the published comic. It becomes clear that while he gathered plenty of material, he took some liberties when it came to making a comic out of them – particularly in Footnotes, in which he re-imagines events that happened 50 years ago. Insights into Sacco’s work process can be also gained from three short documentary films displayed on a screen (6 minutes in total), produced in 2011 by Portland Monthly and the Oregon Museum of Science and Industry: “Reporting from the field”, “Tools of the trade” and “Inspiration of Robert Crumb” (also available online). Another section of the exhibition traces the history of comics journalism before Sacco by way of “special artists” and reportage drawing from the 19th century on. Reference photograph (still frame from “Reporting from the field”). There is some more original art on display from Sacco’s more recent comics, which I’m not too crazy about. In the museum’s library, all of Sacco’s published works can be read in German and English. And then there’s another sensational exhibit: The Great War from 2013 (or 2014, according to the museum), in which Sacco tells the events of one day of a British military unit in WWI. The publication is subtitled An Illustrated Panorama, but I gather it comes in the form of a leporello (“accordion”) book. In the exhibition it is arranged in a semicircle. Not a comic, strictly speaking, but definitely an eye-catcher. An exhibition view with Joe Sacco’s “The Great War” (photograph by Cartoonmuseum Basel). In an exhibition leaflet, Sacco is quoted (my translation): “Journalism is about countering the endless lies, even though it sometimes reiterates them – intentionally or unintentionally.” In this regard, journalism and scholarship are very much alike.